Balloon framing differs from platform framing in that the studs used for exterior and some interior walls are continuous, passing through the floors and ending at the top plates which support the roof framing. 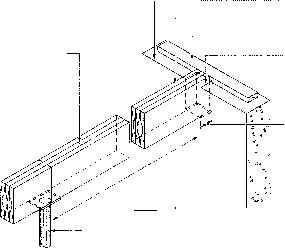 Since the connections between the floor joists and studs in balloon framing do not lend themselves to préfabrication or easy assembly on the site, this method of framing houses is rarely used. However, some of the techniques involved in balloon framing may be used with the platform framing method. For example, ceiling joists or dropped ceiling may be supported on a i x 4 in. (19 x 89 mm) ribbon let into the studs. Floor joists may also be supported in this manner where the level of the floors is offset at an adjoining wall in split-level houses. In some two-storey houses, the centre load-bearing wall in an otherwise platform-framed house is balloon framed to provide convenient passage for heating ducts and pipes.